The R2AC/McKnight Anishinaabe Arts Initiative Grant Deadline is March 5, 2014. We hope you’ll apply! Open to native American artists in all art disciplines. Available to those residing in Beltrami, Clearwater, Hubbard, Lake of the Woods, Mahnomen, Cass, Becker, Roseau, and Itasca counties. Covers arts costs associated with performance, production, exhibition, materials, equipment, mentoring, workshop attendance. Grant application forms are available online at https://r2arts.files.wordpress.com/2011/11/aai-grant-fy14.pdf or at our Region 2 Arts Council Office, 426 Bemidji, Avenue, Bemidji, MN 56601. Call or email us for individual assistance and to answer questions: 218-751-5447 / 800-275-5447, or staff@r2arts.org. Open to Native American Artists residing in Beltrami, Mahnomen, Becker, Cass, Itasca, Hubbard, Lake of the Woods, Roseau and Clearwater counties. Must be 18 years or older and a tribal enrollee or a descendant. Grant application packets are available for download at https://r2arts.org/grants/anishinaabe-grants/at or at the Region 2 Arts Council office at 426 Bemidji Avenue, N. in Bemidji. Artists apply for grants up to $1,000. Individual Artists residing in Beltrami, Clearwater, Hubbard, Lake of the Woods, and Mahnomen counties are eligible to apply for this grant. Must be 18 years of age or older. Applications for Individual Artist Grants are available at the Region 2 Arts Council Office, 426 Bemidji Avenue, Bemidji, MN 56601 and are also available for download from our website https://r2arts.org/grants/artist-grants/. IAG and AAI grants offer funding for costs associated with the exhibition, performance, or production of a creative work; purchase of materials or equipment necessary for a creative work; educational opportunities; mentorships; and proposals for career-enhancing projects or opportunities. This grant is open to artists in various stages of their arts interests and careers. Region 2 Arts Council staff is happy to discuss your ideas with you or assist you in completing the application form. Call 751-5447, toll free at 1-800-275-5447, or e-mail staff@r2arts.org. Miigwech and Thank You to the McKnight Foundation for funding this grant opportunity! 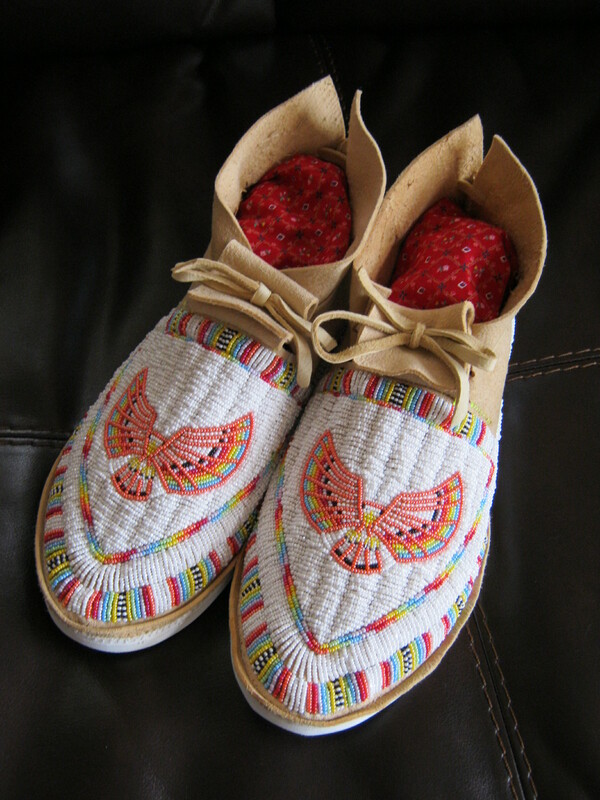 AAI Grant Recipients Dennis Williams and Dana Goodwin, beaded moccasins. Native Artists residing in Beltrami, Mahnomen, Cass, Becker, Itasca, Clearwater, Lake of the Woods, Hubbard, and Roseau counties! If you’ve been thinking about writing one of these grants, now is the time! The deadline is THIS WEDNESDAY at 5:00 p.m. Either drop off your grant at 426 Bemidji Avenue in the lower level of the Carnegie Library Building or have it postmarked by March 6th and put it in the mail. Don’t let your perfectionist-self hold you back! Office staff reviews all grants that have been submitted by the deadline date before sending them off to the AAI Council for review. Open to individual Native American artists in all arts disciplines. This grant offers funding for costs associated with the exhibition, performance, or production of a creative work; purchase of materials or equipment necessary for a creative work; educational opportunities; mentorships; and proposals for career-enhancing projects or opportunities. Artists can apply for grants up to $1,000. Download an AAI grant application packet here: https://r2arts.org/grants/anishinaabe-grants/. It’s Give to the Max Day in Minnesota! Don’t forget to make a donation to support your favorite non-profit in your community and in the state. Many arts non-profits in Region 2 are awaiting your show of support. Go to www.GiveMN.org and make a contribution today! Upcoming R2AC Individual Artist Grant Deadlines: Next Week! Open to individual Native American artists in all arts disciplines. This grant offers funding for costs associated with the exhibition, performance, or production of a creative work; purchase of materials or equipment necessary for a creative work; educational opportunities; mentorships; and proposals for career-enhancing projects or opportunities. Open to Native American artists residing in Becker, Beltrami, Cass, Clearwater, Hubbard, Itasca, Lake of the Woods, Mahnomen, and Roseau Counties. Artists can apply for grants up to $1,000. Open to artists in all art disciplines. This grant offers funding for costs associated with the exhibition, performance, or production of a creative work; purchase of materials or equipment necessary for a creative work; educational opportunities; mentorships; and proposals for career-enhancing projects or opportunities. Open to artists residing in Beltrami, Clearwater, Hubbard, Lake of the Woods, and Mahnomen Counties. Artists can apply for grants up to $1,000. Applications are available at the Region 2 Arts Council Office, 426 Bemidji Avenue, Bemidji, MN 56601 and are also available for download from our website, https://r2arts.org/grants/grant-deadlines/. We would be happy to discuss your ideas with you or assist you in completing the application form. Call 751-5447, toll free at 1-800-275-5447, or e-mail staff@r2arts.org. These grants are made possible by a Region 2 Arts Council grant with funding from the McKnight Foundation. Thank you!